When reload 38 spl 148 gr hbwc to shoot in a 357 gun, do you extend the OAL to reduce the bullet jump distance to the forcing cone ? No, I have never done that. Have never heard anybody doing it but you could always try. If you can't resist, seat the wadcutter flush in a .357 case. Probably have to use a half grain more powder. I have loaded and shot thousands of .38 special rounds using 148 gr cast bullets with an extended COL without any problems. I only shoot these rounds in my S&W 66 and 586 (.357's 4in barrels). From what I've seen it reduces leading in the cylinders. I am interested in learning why this shouldn't be done. I don't use these loads in my BE pistols, just concerned with the safety of it. Bullet alignment. Excessive case capacity. It won't hurt but serves no purpose. Rebs, It will not make it more accurate. If you think about it if it made it more accurate you would do it for the 38 special also. The bullet is almost 1/2" from the forcing cone in the 38. Other then that I shoot a 14-6 and a 27-3 with the same bullet I use in my model 52. I can not tell any difference in accuracy. The revolvers will both shoot sub 10 ring groups from a rest at 50 yds. Good enough for me. Thank you for the replies I guess maybe I have too much time on my hands. No bad questions, Elmer Keith wouldn't come up with magnums without trying stuff. First, you have to find out what works in your gun. How do factory .38 special wadcutter loads work? Any reload you make will be lucky to be as accurate. We can tell you that we don't do that, but that doesn't mean you might not find it better. The thing is, the reason, if valid, would necessitate the use of .357 mag cases any way, so get the "right" cases. DEWCs: you can seat them out to first crimp groove, if testing shows that is more accurate. If you load just below flush with the case mouth is there any chance of bullet set back when you shoot them ? Due to the rules described by some Newton guy (I think), when the gun goes back in recoil the bullets in the other chambers want to sit still. That would make them move out of the case until they meet the crimp. Besides holding the bullet in place until you get good combustion, I give a healthy crimp to keep the cylinder from getting locked up by bullet pull out. rebs wrote: If you load just below flush with the case mouth is there any chance of bullet set back when you shoot them ? If you have adequate case neck tension, that shouldn't be a problem. You could test this if you're concerned, by making a dummy round and attempting to push the bullet in further with a small dowel or a punch. Like Steve said, recoil makes bullets want to come out of the case, not go in deeper. 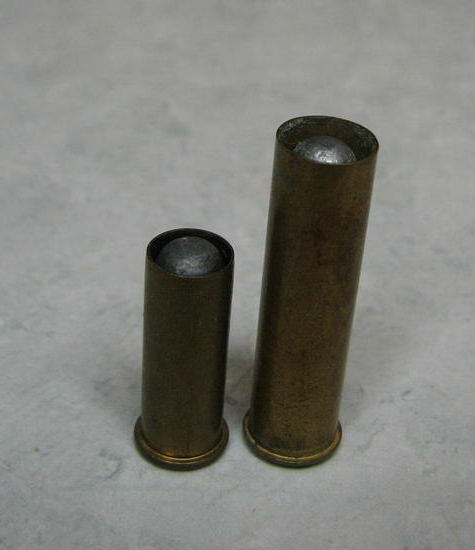 USSR wrote: Like Steve said, recoil makes bullets want to come out of the case, not go in deeper. Ive noticed when not resizing and just crimping recoil will not force the bullet out but the bullet will move back in the case against the powder charge. Usin ..357 cases you might resize, flare and seat the bullet to a depth =to a .38 sp.. then roll crimp to case size. This is what the old .38-44 S&W target gun used. I am assuming you are using a roll crimp then. Try a taper crimp. A 9mm taper crimp die should work. I've got the 4 die Lyman .38/.357 set which includes a taper crimp die. I'll just say this. When revolvers ruled in PPC matches, there were many matches won by officers shooting factory .38 SPL HBWC cartridges in .357 magnum cylinders. At one time, some pistolsmith actually made a short .38 SPL length cylinder with a barrel set back to meet it for shooting .38 SPL wadcutters only. It was reasoned that this would give better accuracy. It turned out that it had the same accuracy as regular revolvers with factory cylinders. Now that revolvers aren't very popular, a lot of this information has been overlooked, except by old f@rts like me. My thoughts are that you are creating a solution for a problem that doesn't exist. Yep, my 6" model 66 has shot 2" groups off sandbags at 50 yds.